Put action into your customers’ insights. By now you’ve learned that managing your online reputation is important, and that the most beneficial way to do so is through earning online reviews from your customers. Although it is great to have a good reputation and earn new customers through your positive review presence, what are some other actionable ways that you can use customers’ reviews? Online reviews do not only have to stay confined to the internet – they can be brought to life by aiding in your internal and operational day-to-day to better your business. Gathering feedback from your audience through online reviews helps you gain insight from their experience. Feedback from online reviews helps your business, product(s), and/or customer experience improve due to the reactions and suggestions received. Well, reviews don’t only exist as customer opinions for others to learn about your business – they also serve as feedback from customers for you to take into serious consideration. Of course, you want to do more of what they say you are doing well, and take note of areas for improvement. Your reviews inevitably won’t all be entirely positive, so make sure to notice the less-than-favorable or suggested enhancements from customer experiences. 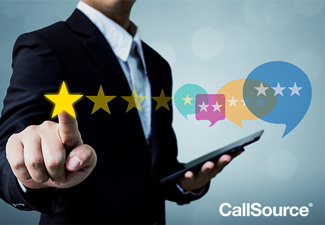 As long as you have someone assigned to regularly be checking your new online reviews or – even better – an aggregate online review system, then you can stay on top of what consumers are saying about your business. From here, keep track of improvement suggestions to implement in your products or internal processes. Do you need a review platform to help you manage your online reviews? Talk to a CallSource representative for our solution today. Next, look at some competitive benchmarking. By viewing online reviews of your competition, you will learn what you can do that your competitors can’t or what you do better than they do and vice-versa. Determine if any improvements or processes can be improved by what your peers are doing. Do customers seem to comment on one aspect of their business that they really like that you can implement on your end? Maybe you should start doing something similar! Do they seem to lack in customer service but you know that is the bread-and-butter of what makes people choose you over them? Continue to work on staying great in that area of your business. Once you start using your online reviews to make improvements, you should gain more positive online reviews simply from making your business better and listening to customer feedback. Update customers who left reviews suggesting (or complaining) about a particular aspect of your business when you implement changes so they, and the rest of your audience, see that you are listening and improving thanks to your customers. This not only shows that you actually take time to read reviews but listen to them and take action as well. And you are now a more trustworthy, personable and great business for doing so. Before you can implement necessary changes to complaints, you’ll need to address the unhappy customer. Need help responding to negative reviews? Download our free step-by-step guide here.